I had my first ever composed salad when I was traveling abroad for the first time without my parents in high school. That’s not to say that I didn’t have many salads before this trip, but a platter of beautiful vegetables composed just so was new to me. I was in Italy in the town of San Gimiganano a beautiful walled city on a hill top. It was overwhelmingly beautiful as most of Italy is. My friends and I found a trattoria with a roof top deck that looked out over the city and had yet another amazing lunch. We ordered our meals and the owner brought out a large platter of vegetables that could have been the subject for a still life. It wasn’t quite an antipasto, it was potatoes and green beans, hard boiled eggs, fennel and possibly chicory. All aesthetically plated and drizzled with a anchovy-ish, garlicky vinaigrette. I loved it! I loved it for the taste and simplicity. Just thinking about Italy makes me swoon. I had some beets and leeks in the crisper that I wanted to use up and through together this not so "still life" like, but still delicious nonetheless salad. 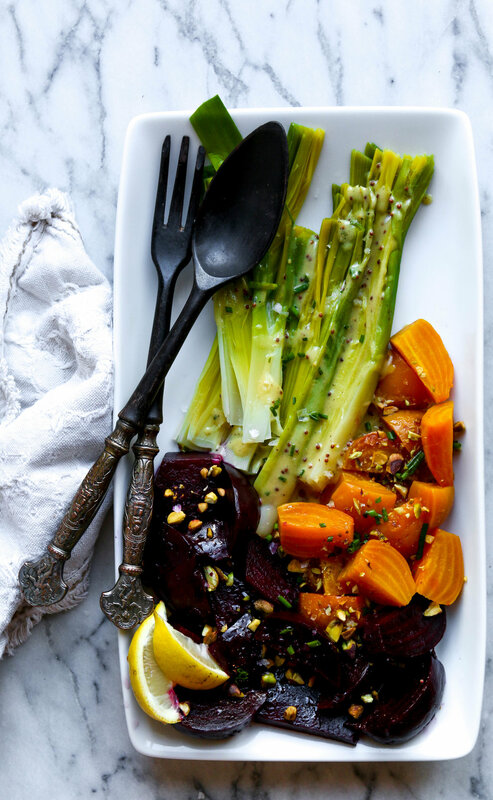 Simply roasted beets, blanched leeks with a delicious vinaigrette, topped with some chopped pistachios and fresh herbs that are still growing in my winter garden. It made for a great side that night with dinner and an equally good lunch the following day. If you're feeling a bit of trattoria/bistro-esque vibes, through together a platter of veggies with a good baguette, maybe pair it with your favorite everyday wine. Preheat oven to 425 degrees F. Place beets on aluminum foil and drizzle with olive oil and season with salt and pepper. Seal the foil around beets and place on a baking sheet. Roast until tender about 60 minutes. If using different colored beets I would recommend doing a foil packet for each color. Let cool for 30 minutes, then peel and cut in half or quarters. Bring a large pot of water to a boil. Add leeks to boiling water. Reduce heat and simmer for 10 minutes or until leeks are tender. Remove leeks and rinse under cold water. Drain and blot dry with a clean towel. Set aside. To make vinaigrette: in a medium bowl whisk together mustard, wine vinegar, maple syrup, chives and garlic. Slowly whisk in olive oil. Add salt and pepper. Compose leeks and beets on a platter. Drizzle with vinaigrette. Salt and pepper to taste. Serve chilled or at room temperature.